OLD FASHIONED MILK PAINT ? Caron holds painting classes on how to mix, apply, and antique a project that you take home when you complete the class. Class times usually run from 2 to 3 hours depending on the number of students. There is a maximum of 8 students in each class, so call and register early, or fill out the request form to the right for further information. The class is $75.00 with a 50% deposit due at registration. A full refund will be given if you cancel at least 2 weeks prior to your class. All materials such as the class project, a six-peg Shaker peg rack, milk paint, brushes etc. are included in the cost. All you need to bring are some clothes and shoes you don't mind getting paint on. The class is $150.00 with a 50% deposit due at registration. A full refund will be given if you cancel at least 2 weeks prior to your class. milk paint, brushes etc. are included in the cost. All you need to bring are some clothes and shoes you don't mind getting paint on. For personal items to be painted, call Caron for a price quote and availability. Discount to students from The Windsor Institute of Hampton, NH taught by Michael Dunbar. 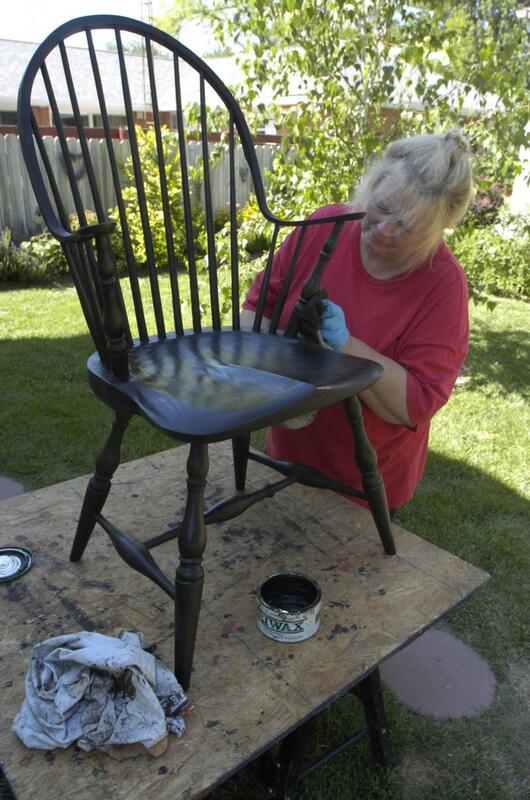 Caron hand waxing a Continuous Arm Chair "or C-Arm as it is sometimes called." We are located approx. 75 miles north of St. Louis, Missouri and approx. 48 miles south of Hannibal, Missouri on Hwy.79 along the Mississippi River. to find other artisans and shops here. "There is a lot to do and see so why not make a weekend of it ? You'll love it ! products that you can purchase at our shop.